This page provides information for individuals that are considering coaching baseball for the first time and for a coach that is returning for another season but may be coaching in a higher division or moving from an Assistant Coach to a Head Coach role. Individuals that are volunteering to coach a team (Rally Cap to Midget) in the Lacombe Minor Baseball Association (LMBA) are required to complete the Respect in Sport online course, which can be accessed through the following Baseball Alberta link: Respect in Sport (Online Course). This is also the minimum certification course required to coach in the Rally Cap and Rookie divisions. All coaches will also be required to submit a signed LMBA Coaches Code of Conduct. Please click HERE to access this document. A police background check is required for anyone volunteering to coach at the Mosquito (11U) division or higher. Rally Cap and Rookie are not considered "drop-off" programs. The City of Lacombe Police Service can provide a background check for people that live in Lacombe. If you live in Lacombe County or a community without an RCMP station, the Blackfalds or Ponoka RCMP detachments can provide this at your request. Individuals with a receipt will be reimbursed by the LMBA if they are charged for this background check. Although Respect in Sport (see above) is the minimum certification required for Rally Cap and Rookie, coaches are encouraged to also take the Initiation Coach certification which consists of completing an online module (1.5 hours) and then attending a local clinic (4 hours). The LMBA requires each Head Coach at the Rookie level to take the Initiation Coach certification and will fully reimburse the Head Coach for the course fee. More information can be found by clicking on the following links, Coach Initiation in Baseball - Online Module and Initiation Coaching Clinic. An overview of the Initiation Coach certification can be found by clicking HERE. Additional information about the Initiation Coach certification can be found by clicking HERE. To register for the Coach Initiation in Baseball - Online Module, please click HERE. To find an Initiation Coaching clinic location near you and register, please click HERE. The coaching requirements for each of these divisions is different and also depends on if you are coaching a Community A or Competitive AA team. Another factor that will determine the coaching certification required is the coaching role you have on the team (Head Coach or Assistant Coach). To assist you in determining what certification you require, please visit the Baseball Canada NCCP (National Coaching Certification Program) page and use the Tell Us Your Coaching Goals section. In this section you answer 4 questions (province, division you're coaching, coaching class - A, AA, etc. and your coaching role - Head or Assistant Coach). Once you fill this out, it will tell you what coaching certification courses are required and you can click on each type of certification course for further. 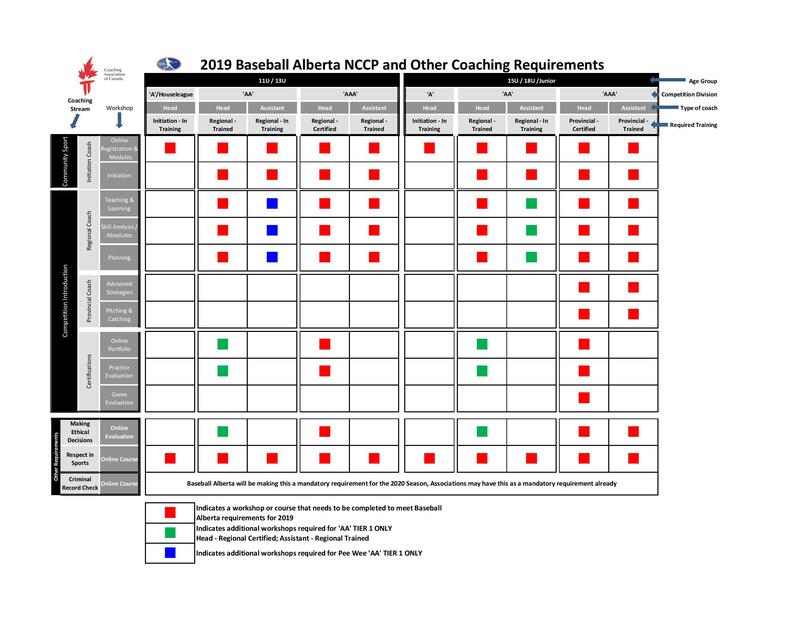 There is also a chart on the Baseball Alberta website that provides an overview of the overall coaching certification required within each division, class (A, AA, etc.) and based on the coaches role (Head or Assistant). The chart can be accessed by clicking HERE. To find an coaching clinic location near you and register, please click HERE. The Baseball Canada NCCP FAQs website is an excellent source of information for individuals that are considering coaching baseball for the first time and for a coach that is returning for another season. Please click HERE to access their list of FAQs. If you require additional information, please contact the Coach and Player Development Director listed on the Executive page. The Coaches tab at the top of the Baseball Alberta homepage also has a variety of information about coaching certification.